Queso flameado (or flaming cheese) is one of my favorite indulgent dishes. It’s nothing more than melted cheese in a cast-iron skillet with some sausage and an occasional green chile thrown in for good measure. It’s served fresh and bubbling hot to be spooned into warm tortillas. The Homesick Texan has an awesome recipe for this dish of cheese and chorizo awesomeness. Yes, I used the word awesome, or some derivation thereof, twice in that last sentence because it’s a totally appropriate usage. The down side to queso flameado – besides the fact that you might as well just wipe it on your thighs – is that it has to be piping hot to stay ooey and gooey and melty. When it’s fresh out of the oven or off of the grill, that’s just fine. In fact, I’ve been known to serve it from a pan on the grill during an outdoor party. But, when it sits around, it starts to get stiff and not so melty, making it not the best option to sit on a table of party fare for an extended period of time. When I was trying to come up with a way to serve queso flameado at a party without having to involve a heating element, it occurred to me that it would be great stuffed in bread, with the bread also providing the perfect vessel for transferring the cheese from plate to mouth without the need for a utensil. 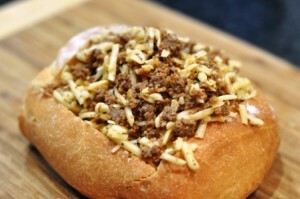 I put this theory to the test and voila, I offer you bread stuffed with chorizo and cheese. Bread, cheese, and sausage. What could be better? Cook the chorizo in a medium skillet over medium-high heat until cooked through. Drain well on paper towels and let cool slightly. While the chorizo drains and cools, hollow out the bread to create a 1 inch thick bread shell with a wide opening at the top (sort of like a brad bowl, or I suppose a bread tray). Save the bread you remove for fresh breadcrumbs. In a medium bowl toss the mozzarella and jack cheeses with the cooked chorizo until well combined. 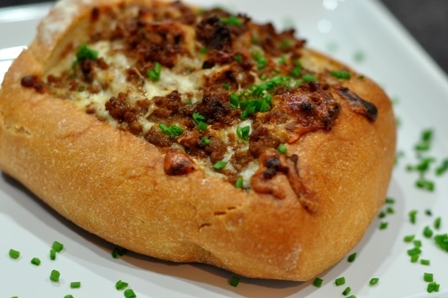 Fill the bread shell with the cheese and chorizo mixture, mounding it in the center until almost overflowing. Place the filled bread on a rimmed baking sheet sprayed with cooking spray. 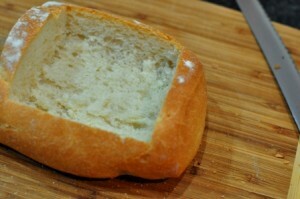 Bake for 25-30 minutes or until the cheese is melted and the top of the bread nicely browned. Be sure to use fresh pork chorizo in this recipe and not cured Spanish chorizo. You can substitute Italian sausage in this recipe, or really any other bulk sausage you’d like. For an Italian take on this dish, use hot Italian sausage, a combination of mozzarella and provolone cheese with a bit of parmesan cheese grated on top for good measure. Garnish with chopped Italian parsley or fresh oregano. You could easily toss a can of drained4 oz of chopped Hatch Green Chiles (or roasted Anaheim peppers) into this dish for a little more of a kick and depth of flavor.